JERUSALEM (Reuters) - Israeli voters' security concerns have boosted Benjamin Netanyahu's popularity in the past month, helping him to skirt criticism of a widened rift with the White House as he aims for a fourth election success. With violence on the Lebanese border and worries about Iran's nuclear program high on voters' minds, the conservative leader's reputation for being strong on security helped to raise his approval rating to 51 percent from 46 percent in January. The same monthly opinion poll, conducted on Sunday and published in the left-wing Haaretz daily, forecast Netanyahu's right-wing Likud party would win 25 of parliament's 120 seats in the March 17 election against 23 for the center Zionist Union. Last month it gave Likud 22 seats and Zionist Union 23. 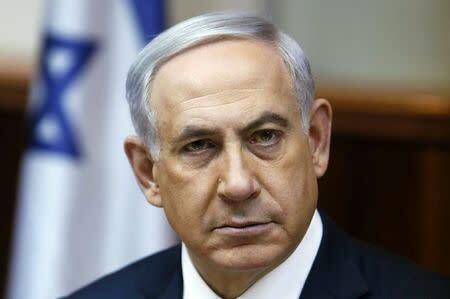 The latest figures showed him on course to build a governing coalition of parties from the right, far-right and Orthodox Jewish blocs and return to power for a fourth term, solidifying his position as Israel's longest-serving prime minister since David Ben-Gurion. "It seems Netanyahu has the best chances," said Gideon Rahat, a political scientist at Hebrew University. The poll results will come as a surprise to some: Netanyahu has been fending off criticism at home and abroad over his decision to accept an invitation from John Boehner, the Republican speaker of the U.S. House of Representatives, to address Congress on Iran's nuclear program two weeks before the Israeli election. Many have seen Netanyahu's visit, announced without first consulting the White House, as an insult to U.S. President Barack Obama, with whom he has always had a testy relationship. Yet opinion polls show that Netanyahu is perceived by Israelis as having the steadier hand when it comes to keeping them safe, and he has been peddling that message. A current Likud TV ad shows him ringing the doorbell of parents about to go out for the evening. "You asked for a babysitter? You got a Bibi-sitter," he says, using his nickname. Several other polls last week presented similar figures to those published in Haaretz on Sunday. It still remains possible that the Zionist Union could secure more seats than Likud come the election. But with the arithmetic suggesting that party would struggle to cobble together a working coalition, Netanyahu remains more likely to be the man Israeli President Reuven Rivlin asks to form a government. Israeli newspapers moved their focus recently from security matters to allegations - denied by Netanyahu's lawyers - that his wife Sara pocketed the deposits from recycled bottles purchased for their official residence with state funds. While tricky for Netanyahu, the whiff of scandal has served to shift attention away from issues like the high cost of living and soaring housing prices - the Zionist Union's main campaigning issues. He may however soon have a more difficult hurdle to negotiate: Israel's state comptroller is to release a report on Feb. 17 into alleged excessive expenditures at Netanyahu's residences. The investigation, prompted by complaints about which the comptroller has declined to give further details, will detail expenditures at the prime minister's three residences on items such as food, furniture, clothing, accommodation and staff, and decide whether public funds were misused. And while the polls are comforting for Netanyahu for now, they have been off the mark in the past. In 2013 they failed to predict a second-place finish for Yesh Atid, then a new centrist party that campaigned on economic issues.